I bought Sugar a voucher for a hot air balloon ride – it was for a significant birthday (21?) and so it seemed appropriate that I spend up large. Hot air ballooning is not cheap. And so it came to pass that eighteen months after purchasing said gift we finally organised the trip on a cold, still, crisp and beautiful Hawkes Bay morning. We left Waipukurau (where the children stayed with Nanna) at 5.40 am for a 6.20 am pickup in Hastings. On the way I ran over a rabbit. There was a time when I would have cheered and congratulated myself for ridding the country of one more member of the pestilent breed. But it was Easter, and so I felt a bit mean. Anyway, I digress. We met the very agreeable Andrew Livingston, who was going to be our pilot, and his assistant Colin, who was in the chase vehicle and who no doubt would have reported a disaster if any such thing befell us. The fact that I am writing this post gives some indication we all survived to tell the tale. There were two other couples waiting in the carpark – that meant that seven people would be climbing into a balloon basket not much bigger than the square footage of two toilets. It looked like it would be a tight squeeze. The wind was blowing westerly and a little from the south. Andrew knew then that we needed to head inland so that the journey in the balloon, lasting an hour, would take us past Havelock North but not as far as the Tuki Tuki River. And so we filled the balloon in a park in Flaxmere surrounded on all sides by suburban houses, none of which probably knew what was transpiring so close to their backyards. The balloon inflated in no time at all. We were given a safety instruction on how to land. Basically the men act as the ‘cushion’ for the women should the basket tip over on landing. 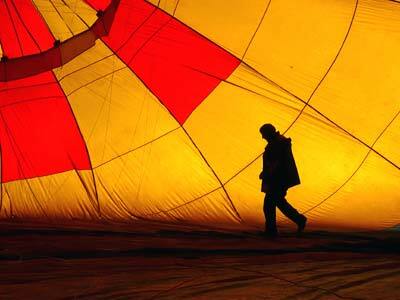 After a few blasts of flaming air into the cavity of the balloon we lifted gracefully, and silently into the air. It was so calm. 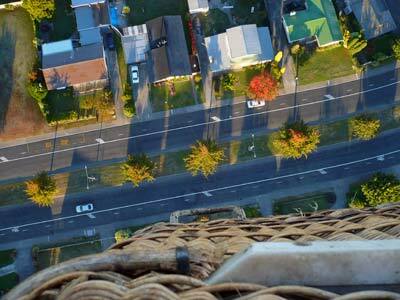 At about 300 feet I began to have a slight feeling of vertigo. I had been led to believe the basket was at chest height, but near the middle the basket barely came up to your waist. So, if you leaned forward energetically then it was entirely possible that you could fall out. For that reason I had managed to secrete myself in the corner where I flung an arm around one of the four main supports that rose to meet the balloon. The view was stupendous. How could it be anything but. We could see all the way north up the coast of Hawkes Bay. Bluff Hill in Napier looked like a pimple. Te Mata Peak in Havelock North didn’t appear to be much bigger. We had a perfect view down into the backyards of Hastings as we floated with the wind towards the coast. Because we are carried with and by the wind there is no sensation of wind in your face – none whatsoever. It’s very strange. Later when we reviewed the statistics from the GPS it revealed that we had reached a top speed of 27 knots – who would have known? The only sound, other than the intermittent blast of gas to keep the balloon inflated was the barking of dogs as we floated overhead. Apparently there’s a high pitched scream as we release gas that sends the dogs into a frenzy. We landed, as gracefully as we could, on the riverbank of the Tuki Tuki River. We drifted about 5 metres above the stop bank – at that point it became clear that we were travelling at a reasonable speed , but Andrew managed to drop us right on the spot, missing power lines by a good 500 metres. For a split second the basket leaned at 45 degrees with the seven passengers all heaving their weight in the opposite direction to right the lean. It was, by all accounts, a perfect landing. A champagne breakfast served by Andrew and Colin topped the morning off. And here’s a tip. If you make warm muffins and you want them to stay warm, then pack them with a hot water bottle. It worked a treat. 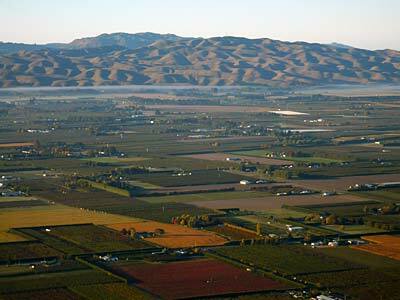 For bookings see www.early-am-balloons.co.nz – they also have a balloon in the Wairarapa. Previous PostSo, you think you’re a designer? Next PostBritain does have talent!